This one sounded like fun from the moment it was announced and presented it's own challenge. This week's #SundaySupper Movement theme is Five Ingredients or Less which is hosted by Alice of Hip Foodie Mom so I knew I had to participate. You might remember her when I welcomed her as a guest last month, so I wanted to participate this week, in part because I admire her so much. The rules noted that water, salt, pepper and cooking oil did not count towards an ingredient list but the dish I created didn't use any of these ingredients directly anyway. Come to think of it, this challenge would be great to be used on Top Chef either as a Quickfire or Last Chance Kitchen, considering many professional chefs like to use many ingredients in their dishes. However, it has been done in the past, as demonstrated by Claire Robinson on 5 Ingredient Fix. Before I proceed forward, I'd like to congratulate Brenda from Meal Planning Magic as the winner of my Carla Hall cookbook giveaway. Prepare a dish using only five ingredients. I've adapted the dish from one I found on myrecipes.com. 1. Toss all ingredients and serve on chilled plates. This salad was well balanced in texture and flavor, with the pecans balancing out the chicken and the sweet dressing balancing out the salad greens. One innovation I'm pleased to share that Alice had brought to the Movement was this logo for this week's event. Very colorful, Alice! Like many of my food blogger friends I've made, I met Nancy of Gotta Get Baked through the #SundaySupper Movement. Like the other ladies I've featured here over the last few months, Nancy has a true talent in the kitchen but her skills are very different than mine. As her blog name suggests, she is a baker which requires precision in what she does which is different from cooking. I'd also like to point out that she's a criminal law attorney so I'm awed that she has the time to maintain a busy career, a family and have time to produce delicious food. I'd like to give you a list of my favorite dishes Nancy has made, but I honestly can't choose because they're all so unique. Something else I admire about Nancy is her writing style. It's often funny, thought-provoking, candid but always sincere. Her straight-forward approach conveys her thoughts in a clear manner and it's something I wish I had. She even has a category of posts called Angry Asian but what makes her different from others is things that get under her skin are very reasonable. How could you argue against common courtesy, cyber-bullying and the public's obsession with celebrities? Before I leave you with Nancy, I'd like to note my strong recommendation to follow Nancy on twitter, instagram, and pinterest, plus add her on G+ in addition to giving her facebook page a Like. Howdy, readers of Crazy Foodie Stunts! I’m Nancy and I blog over at gotta get baked. I’m honoured to be featured in DB’s Adding Some Class series today. I had the pleasure of meeting DB through our Sunday Supper group. He stands out not only for being one of the few men in the group but more importantly because he’s highly intelligent, incredibly talented in the kitchen and he’s always challenging himself to be better at what he does. Given how much I admire DB, I had to think of something ridiculously awesome to make for him. I wanted to go savoury in keeping with the savoury foods DB usually cooks but I also had to bake because, duh, my blog name. Baking’s in my veins. It’s my everything. Bacon. Pesto. Parmesan. Carbs. These are some of the foods that make my world go round and they also happened to be in my fridge. I combined them into no-knead, overnight savoury rolls. In the process, I almost burned my house down. Ok, not really (I’m prone to hyperbole) but I did have a smokin’ hot time baking these, literally. I thought I was being brilliant by baking the rolls in my cheesecake pan for easy removal of the rim after the rolls cooled. People, these rolls were bursting with olive oil from the pesto and a generous amount of parmesan cheese. All of that grease dripped onto the bottom of my oven. The fragrance in the air turned quickly from gloriously delicious to acrid and forest fire-y. Plumes of smokes were billowing out of my oven. I.freaked.out. The fire alarm would not stop ringing. My poor dog was beside herself. As I stood there fanning the smoke out of the open windows, the words “grease fire” kept running through my head. I wondered if I had enough time to google “what to do when the oven’s on fire and you don’t own a fire extinguisher”. Thankfully, it didn’t come to that. I didn’t burn my house down and I ended up with these fabulously crispy, flavourful bacon pesto parmesan rolls. I used home made pesto but you can also use the store bought stuff. Cook the bacon in a heavy skillet over medium heat, stirring until crisp and golden. Place the cooked bacon on paper towels to cool. Reserve 2 tablespoons of the bacon grease. 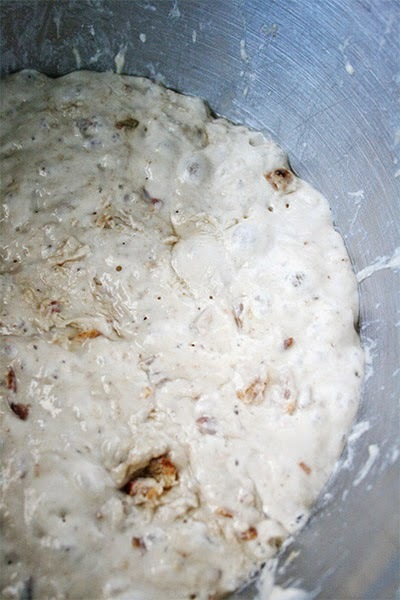 In a medium bowl, stir together the flour, bacon, salt and yeast. Add the water and reserved bacon grease. Using a wooden spoon or your hand, mix together until you have a wet, sticky dough. Cover the bowl and let sit at room temperature until the surface is covered in bubbles and the dough has doubled in size, anywhere from 12 to 18 hours. When the first rise is complete, generously flour a work surface. Using a bowl scraper or rubber spatula, scrape the dough out of the bowl in one piece. Flour your hands and lift the edges of the dough towards the center, making a round ball. Generously dust a tea towel with flour and place the dough in the centre of the towel, seam side down. Flour the top of the dough. 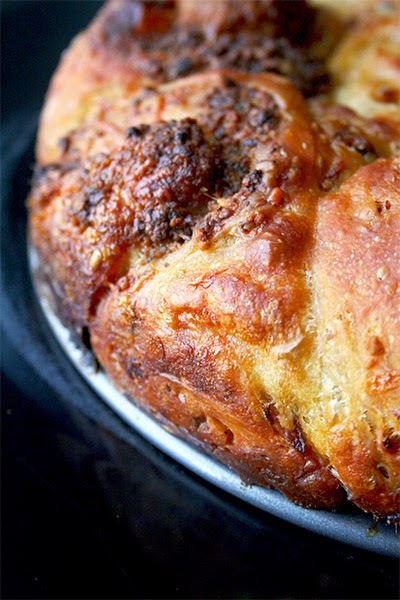 Fold the ends of the tea towel loosely over the dough to cover it and place it in a warm spot in your kitchen to rise for another 1 to 2 hours. The dough is ready when it has doubled and it holds the impression when you gently poke it with your finger. Half an hour before the end of the second rise, preheat your oven to 400 degrees F. Use a round 9 inch cake pan or a square 9X13 pan to bake the rolls. I wouldn’t recommend oiling/greasing the pan because oil will pool on the bottom from the pesto as it bakes. Unwrap the dough and place it back onto the floured work surface. Cut the dough in half. Cut one half into four strips. 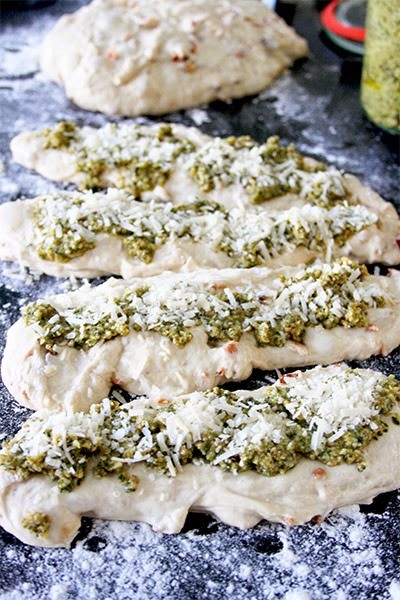 Place as much pesto and grated parmesan as you want onto each strip. Roll up the strips – note, the dough is very wet and sticky. That’s how it should be so don’t be concerned. Place the rolls in your pan. Repeat the process with the other half of the dough. Bake in the oven for 30-40 minutes. After the first 20 minutes of baking, I turned the heat down to 380 degrees F because my rolls were browning rapidly. If the top is browning too much for your taste, you can also cover the pan with aluminum foil at this point. The rolls are ready when they’re dark brown. Allow to cool and then dig in! 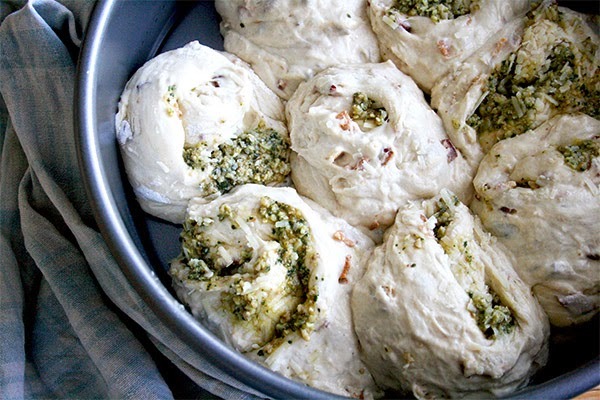 The edges and bottom of the rolls are incredibly crispy and crunchy, the inside is soft yet a bit chewy, and the bacon and pesto are fabulously flavourful. The Husband and I couldn’t stop eating them, which isn’t saying much because we’re pigs but honestly, these rolls are delicious. The rolls are best the day they’re made. Store at room temperature in an air tight container. If they last longer than a couple of days, I recommend toasting them or heating them in the microwave before eating. That’s it, folks! Thank you so much for inviting me here, DB! Once again, Nancy has delivered. Bacon, pesto, and parmesan are some of my favorite ingredients. I'd like to thank her for being my guest today! Before I leave you, please be sure to enter my Carla Hall cookbook giveaway and the garlic lover's prize package giveaway by tomorrow night when they both end! I know I've left you for another week, but I have been busy working and I'd like to give an update. This past Saturday, I attended an event with Carla Hall from seasons 5 and 8 of Top Chef and currently of The Chew in San Jose. She demonstrated a recipe and signed copies of her new cookbook, Carla's Comfort Foods: Favorite Dishes from Around the World by Carla Hall with Genevieve Ko. I picked up a copy for myself and a second one to giveaway to my readers. More on the details below. During her demonstration, she noted that the book brings together flavors from different cultures in an attempt to illustrate similarities between them. One example is burgers. She gives tips on how she prefers to prepare them and then adapts the dish by using different spices to make a Persian pita and a Vietnamese banh mi. Display recipes from the book to entice my readers to want to enter my giveaway. The pork recipe was taken from page 147 and the slaw was taken from page 12. 1. Prepare the slaw: Start by combining the cabbage and 1 1/2 teaspoons kosher salt in a large colander and let it set. After ten minutes have elapsed, wring the cabbage with paper towels to remove any moisture. While waiting for the cabbage, whisk together the mayonnaise, cider vinegar, sugar and celery seeds in a large bowl. Add in the carrots, onion and cabbage, then toss to combine. This can be completed up to twenty-four hours before serving but toss again before serving if necessary. 2. Prepare the pork: Preheat the oven to 425° Fahrenheit. Meanwhile, combine the vegetable oil, paprika, poppy seeds, cinnamon, 1 teaspoon kosher salt, and black pepper in a small bowl. Apply this rub on all sides of each tenderloin and let it stand in an oven-safe skillet or rimmed baking sheet while the oven comes to temperature. Roast the pork until it reaches a temperature of 135° Fahrenheit with an instant-read thermometer, approximately 15 minutes. While the pork cooks spread the parsley and dill on a sheet of parchment and set aside. Remove from oven and roll the tenderloin in it's drippings, then in the herbs. Let it rest for five minutes to allow for carryover cooking, then slice each loin on a bias. To plate, spoon some of the slaw off center of the plate then fan the loin slices around the slaw. Due to it's relative ease of preparation, I recommend this dish as a weeknight meal. I also thought about the pairing of these two recipes because I consulted The Flavor Bible which noted that cabbage complements pork well. The fresh herbs used in this application were unusually flavorful. In other news, Mrs. Stuntman and I celebrated our anniversary earlier this week. Long time readers might remember we celebrated at home last year where I prepared a radicchio appetizer, a lamb entreé, and an espresso dessert but this year Mrs. Stuntman chose The Basin in Saratoga, California. We ordered two appetizers, but ordered the same entreé. I am giving away 1 hardcover copy of Carla's Comfort Foods: Favorite Dishes from Around the World by Carla Hall with Genevieve Ko autographed by Carla Hall. The contest will end on Saturday, April 26, 2014 at 12 midnight Pacific Standard Time. This giveaway is open to Continental US residents only. When the contest concludes, the winner will be chosen by random draw. I will then notify the winner through e-mail and they will have 3 days to respond or another winner will be chosen. Yikes! Has it really almost been two weeks since I gave you my last dish? Time certainly has escaped me but I have some great things planned in the next couple of weeks. If I can be candid for a moment, I really haven't prepared anything new that's suitable here or I'd prepared dishes that I've already published here such as my rice and chicken dish and my short ribs dinner. I was able to prepare this kale salad during my time off and thought it would be perfect to note here to hold you over while my other projects materialize. I didn't make many adaptations from it so let me refer you to Elise of Simply Recipes for the recipe. 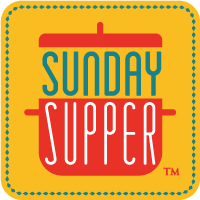 One of the things in development was a feature with Isabel of Family Foodie and founder of #SundaySupper Movement called Sunday Supper Super Stars where one member is highlighted each Friday and this week is my turn. If you're a long time reader, you'll learn an interesting fact about me that I've yet to discuss with you here. Click on Sunday Supper Movement to view it. My regular readers will remember I prepared this dish a couple of months ago but I had problems with the accompanying sauce. Well, after I published it I found other versions that all had similarities that differed from the Anthony Bourdain version I adapted. The same basic recipe I found from Culinary Institute of America and Fabio Viviani used the same procedure of: sear the beef then set aside, deglaze with brandy or cognac, flambé, add veal stock then reduce, add cream and simmer until thickened. One note I'd like to make here is that the recipe calls for 6-ounce fillets. I used 12-ounce New York strips, however almost any steak will suffice. For me, it's a personal preference. I know the fillet is renowned because it's tender but my palate isn't refined enough to detect the difference in taste. I value taste over texture. That, and the fillet is at least double the price of the New Yorks. Update the recipe for a dish I previously prepared. I adapted the dish I found on SAVEUR Magazine's website. 1. In a heavy bottom large skillet, melt the butter in the vegetable oil over medium-high heat. Season the steaks with the cracked black pepper and kosher salt. When the pan is hot, add the steaks and sear for approximately 4 minutes on each side for medium rare. Remove each steak to a separate warmed serving plate and set aside to allow for carryover cooking while the sauce is prepared. 2. Deglaze the hot skillet by adding the brandy to the pan and then light it on fire with a long-stemmed match. Keep a non-flammable lid nearby if the flame hasn't extinguished itself within 1 minute. Add in the stock and reduce by half, approximately 4 minutes. Then add the heavy cream and cook until the sauce thickens, approximately 3 to 5 minutes. Season the sauce with salt if necessary. Spoon one to two ounces of sauce over each steak, then top with fries, garnish with chives and serve. Since it is April Fool's Day, I thought I'd leave you with a funny story: I finally successfully executed a flambé. I had previously shyed away from it due to the obvious dangers, but I got the nerve the night I prepared the dish to attempt it. While my steaks were searing, I prepared my work station by turning on the vent, opening the windows so I wouldn't set off the smoke detectors and moving anything that was easily flammable away from the pan such as cardboard boxes or cans with paper labels. When I lit the brandy on fire, it was woefully anti-climatic. I had one or two flames about one inch high that lasted for maybe five seconds. I'm just thankful the fire department didn't need to be called. I'll now leave you with the #WeekdaySupper dish that was published yesterday in addition to a preview of the dishes that will appear later in the week.